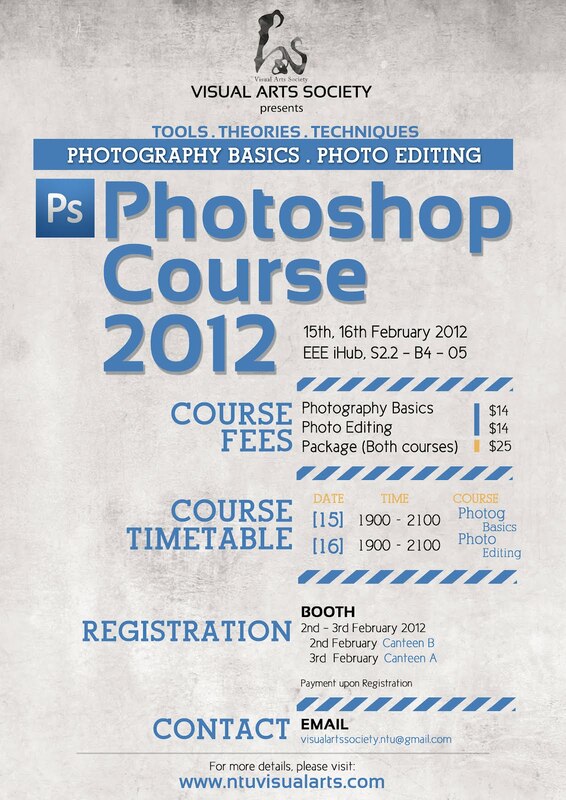 NTU Visual Arts Society News Blog: Photography and Photoshop Workshop 2012 - Sem 2! 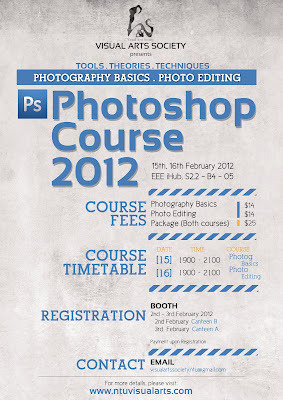 Photography and Photoshop Workshop 2012 - Sem 2! The VAS Comics Ensemble is proud to be organizing our its flagship 2 day Photography/Photoshop Workshop on the 15th and 16th of February, 2012. We will be inviting an external professional photographer to share his tips on capturing that perfect moment forever, and how Photoshop can be used to enhance the photos you have taken. These courses will be pitched at the level for the absolute beginner, so don’t worry if you have had no prior experience with Photoshop. The course fees are as follows: $14 for the Photography Basics course, $14 for Photo Editing course, or $25 for both courses. Price: $14 for each course, or $25 for both courses. If you have any questions, please feel free to email us at visualartssociety.ntu@gmail.com , or just comment on this post. You can also comment on our Facebook page.